In a first of its kind report, the HFS RPA Services Top 10 report examines the role service providers are playing in the evolving RPA market. 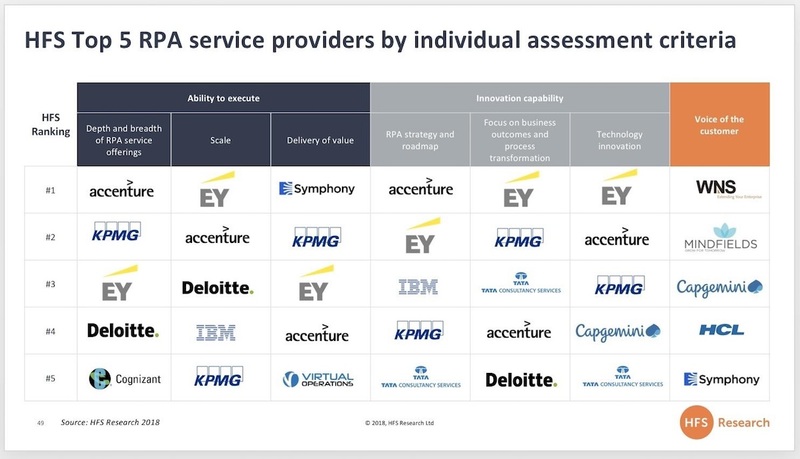 We assessed and rated the RPA services capabilities of 29 service providers across a defined series of innovation, execution, and voice of the customer criteria. The report highlights the overall ratings for all 29 participants and the top five leaders for each sub-category. This report also includes detailed profiles of each service provider, outlining their overall and sub-category rankings, provider facts, and detailed strength and weaknesses. While we may refer in passing to broader intelligent automation or elements of artificial intelligence as part of providers’ capabilities, make no mistake, we focused this report squarely on RPA and assessed all providers only of their RPA services capabilities. A first-of-its-kind comprehensive study of 29 RPA service providers: The HFS Research RPA Services Top 10 report is a first of its kind study where we rated 29 service providers across elements of service execution, innovation, and voice of the customer.No single type of services firm stood out as the de facto leader for RPA services: Our resultant Top 10 leaders are a mixed bag of consultants, global system integrators, and RPA services pure play firms—all supporting customers across the RPA Service Value Chain. The broad roles of the services players reflect a growing but still nascent market with limited talent resources and services firms jockeying to secure their role as the service provider of choice as enterprises scale RPA. The overall Top 10 leaders are EY, Capgemini, KPMG, TCS, Accenture, IBM, Deloitte, Symphony Ventures, Cognizant, and Infosys. These firms exhibited a strong mix of service execution excellence, applied innovation and vision, and verified customer satisfaction to rise to the top of our RPA services study. Being adept at provision of AI-focused services does not make a provider an RPA expert: RPA and the various building blocks of AI are different technologies requiring distinct skills. Many services firms who fared well in our AI Services Blueprint have not necessarily cultivated deep capabilities in RPA. While they complement one another in the intelligent automation context of our Triple A Trifecta, it is critical to ensure your provider has actual RPA chops. Trained RPA talent is growing, but experience is thin: The average number of trained RPA resources across the 29 providers in our study is 1,160, with the median at 675 and total resource base at 32,474. However, HFS estimates that at least 80% of these have less than two years of direct RPA experience. Enterprise satisfaction with RPA services is squarely mediocre: Customers have spoken! The average satisfaction score for our study was 77% out of 100%, with many firms that usually achieve high satisfaction scores receiving lower than typical ratings from both their hand-picked references and HFS’ survey-based ratings. We believe part of the causality lies in enterprise frustration with time to benefits. Transformation takes time. While many small RPA initiatives at a single process or function level can be quickly implemented and proven to show benefits, broader scaling and movement to a hybrid digital and human workforce takes time. The market hype, often from RPA software vendors, continues with its mantra of “RPA is quick and easy,” thus continuing to obscure the reality that RPA and broader intelligent automation is not a quick-hit lever but part of broader scaled digital transformation. Change management and governance capabilities are lacking:Service providers’ ability to provide change management capabilities and assist with setting up and ensuring solid ongoing governance were the lowest rated execution criteria, reflected as an element of depth and breadth of RPA capabilities. Enterprises and service providers alike need to implement these capabilities as ongoing elements of their automation strategies and not just pay them lip service. High satisfaction is tied to focused RPA engagements: The providers that scored well in the voice of the customer metric generally had a very focused approach to how they are offering and delivering RPA—as part of optimizing business processes as with BPO firms or as their sole focus as with the RPA services pure plays. As one enterprise executive put it “the focused approach helps us achieve targeted benefits and then move on without the pressure and expectation of a visible center of excellence and loads of expenditure on licenses.” This belies the lack of scaled RPA initiatives. The biggest gap in RPA services capabilities is in post-implementation: Service providers have built strong depth of capabilities in RPA planning and implementation services. They are less experienced at supporting clients after go-live for management, operations and optimization services. As enterprises continue to scale RPA and broader intelligent automation, HFS expects clear needs to emerge in line with supporting in-house implementations versus managed services. Service providers’ greatest contribution to the RPA market is their IP: While RPA technology skills are valuable, the various frameworks, accelerators, libraries and enabling tools that are being developed by the service provider community to facilitate RPA adoption are their greatest contribution. Much of this IP has been focused on process automation identification and feasibility studies, quantifying potential ROI, and fast tracking implementations. This is now shifting to enablement of RPA extension (RPA+cognitive or AI elements), building industry and domain-specific accelerators, and vendor neutral (and multi-tool) management platforms for integrated human and digital workforces. The prevailing approach to RPA software by services firms is best-of-breed agnostic: All 29 service providers included in our study refer to themselves as RPA software agnostic. This list includes the seven firms that have developed their own RPA software. These firms will generally defer to client choice or existing investments in other tools, but do position their own tools as powerful greenfield options. 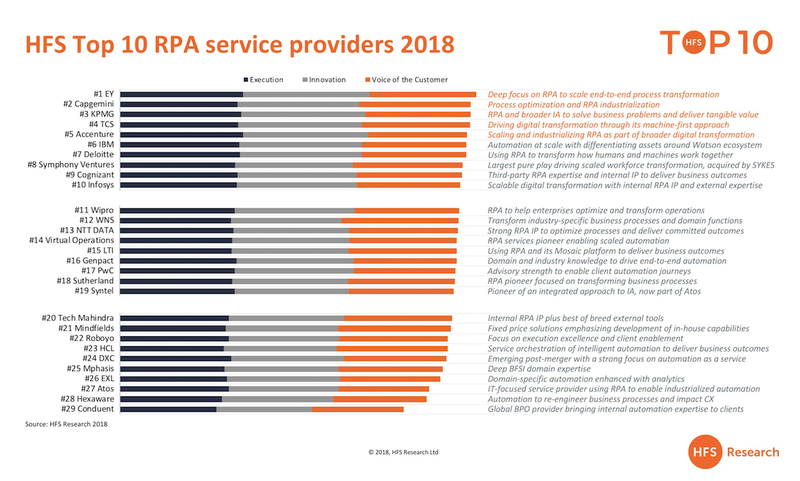 Of the “big three” RPA software products, service providers have the most experience with UiPath: All service providers in our study have built their RPA services capabilities around some variation of the RPA software big three of Automation Anywhere, Blue Prism, and UiPath. UiPath ranks as the RPA software product that service providers have the most experience with, followed by Blue Prism and then AA. Beyond the big three, Pega, Nice, WorkFusion, and Softomotive rose to the top: Service providers have complemented their big three RPA focus with various other firms. Many global service providers already have Pega or Nice practices based on their broader platform capabilities, and RPA is an add-on. This has helped propel Pega and Nice into the fourth and fifth slots, respectively, for depth of use by service providers. WorkFusion was noted as a viable option for BFSI clients, and Softomotive was noted as cost-effective.